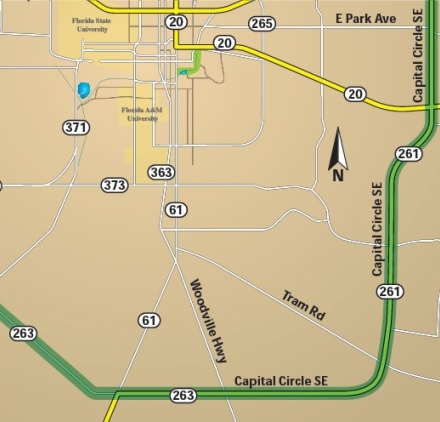 The Capital Circle project is divided into 4 sections. Completed. Not long ago, Capital Circle from Commonwealth Lane to west of Tennessee Street was a three-lane congested road prone to flooding. 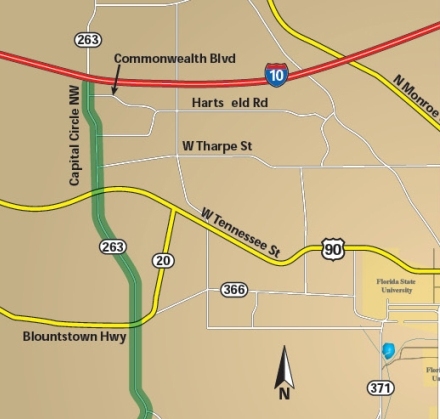 The Capital Circle Northwest Project, as part of the Florida Department of Transportation (FDOT) and Blueprint 2000’s vision for the Tallahassee urban area changed all that. Using your penny sales tax, the road now boasts six lanes of efficiently moving traffic. The project, completed in September of 2007, widened this busy section of Capital Circle allowing for the safe, effective movement of traffic from the Tallahassee Regional Airport to Interstate 10. In addition to the expansion of 1.99 miles of roadway, the intersections at West Tennessee Street, Tharpe Street, Hartsfield Road and Commonwealth Lane were made safer and easier to navigate as well. Using a holistic approach to the development of the entire corridor all improvements were made with the safety of pedestrians, bicyclists and commuters in mind. New landscaped sidewalks and bicycle lanes have increased not only the safety but also the visual appeal of the corridor. The landscape features beautiful trees, lush bushes and manicured grassy knolls. Additionally a regional stormwater facility – a 15.3 acre regional stormwater pond – was built to reduce downstream flooding. The pond provides water quality treatment for the entire watershed and is an attractive part of Martha Wellman Park, located at the intersection of Tennessee Street and Capital Circle Northwest. The park itself was constructed as a part of the road-widening project and includes a paved trail and additional park amenities. Through the cooperative efforts of FDOT, Blueprint 2000, the City of Tallahassee, Leon County, the Northwest Florida Water Management District and the Florida Fish and Wildlife Conservation Commission your sales tax dollars were used to leverage funding partners to accomplish not only the much-needed roadway improvements, but also the amenity of a lush, environmentally sensitive recreational park. In August 2009, Martha Wellman Park was selected by Stormwater Solutions Magazine as a 2010 Top Stormwater Project Winner. The pond, and surrounding park, won the award based on its holistic philosophy, intergovernmental cooperation and innovative approach to the removal of invasive snails. Completed. The Southeast portion of Capital Circle, from Connie Drive to Tram Road, has seen drastic changes since construction first began in May 2005. What originally started as a two-lane, undivided rural road lacking many basic safety features has been transformed into a six-lane divided urban road in a park-like setting. The project’s purpose was to improve the safety and capacity of Capital Circle Southeast by featuring a wide meandering sidewalk, carefully placed bicycle lanes, stormwater improvements, and substantially landscaped medians. The landscaping within the road right-of-way maintains the natural environment while directing views and relieving driving monotony. As with all Blueprint projects aesthetics is an important design element in the Capital Circle Southeast project. Extensive landscaping, including wildflowers and hammocks of trees and shrubs were put in place to beautify this segment of Capital Circle. While some of the mature live oaks along the corridor had to be removed, maintaining as many of the oaks as long as possible was a priority for project designers. The essence of this corridor has been transformed into an exemplary multi-modal model to be emulated for years to come. As the road curves past Tallahassee’s Southwood community, new street lights can be seen coordinating traffic flow, benches and trash receptacles are placed a safe distance from the busy road. Because of its close proximity to the Southwood Plantation and its greenway and recreational trail network, the project design includes efficient links to the nearby meandering trail. Keeping protection of the environment at the forefront, plans for erosion and sediment control throughout the segment were designed beyond industry standards. Six stormwater ponds were constructed to ensure that runoff would not pollute Wakulla Springs or the aquifer. Additionally, three additional stormwater ponds on St. Joe Company property accept part of the drainage from the project, ensuring continued protection of area water bodies. Blueprint designed Capital Circle Southeast with Tallahassee’s future in mind. The additional right-of-way in this area and the 36-foot-wide median will accommodate transit service the future. Your tax dollars, made possible by the one cent sales tax, have taken this project from concept to construction. Completed. 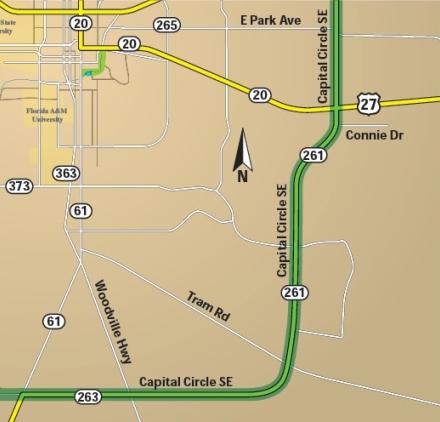 The reconstruction of Capital Circle Southeast from Tram Road to Woodville Highway, an integral part of the Capital Circle corridor, widened 2.3 miles of an existing two-lane road to the present day six-lane facility. Improvements to the segment included intersection improvements at two existing intersections and provisions for three additional signals to increase corridor safety. Additionally, Woodville Highway was expanded from a two-lane road to a four-lane divided facility near the intersection with Capital Circle. To ensure a holistic approach was applied to the entire corridor, Blueprint 2000 included extensive landscaping, 5-foot wide sidewalks, 10-foot wide trails, bicycle lanes and other recreational amenities. This project flows smoothly into the Capital Circle Southeast from Tram Road to Connie Drive segment with consistent landscaping of wildflowers, bark chips and lush trees and shrubs. To the extent it was possible, natural vegetation was maintained along the corridor to sustain a natural environment. The right-of-way for this portion of the roadway lies in a low, flat plain where the sandy soils percolate rainfall slowly. Working cooperatively with the St. Joe Company, Blueprint 2000 negotiated a land swap agreement that allowed retention ponds to be built on St. Joe property that later became a part of the Stormwater Facilities Master Plan. The existing pond in the system continues to receive runoff, however the amount of runoff from the project has been reduced and the remainder of the runoff will be managed in the new stormwater ponds. This effort to build needed infrastructure, protect the environment and accommodate recreational users was made possible by the one cent sales tax. The corridor is the last segment in the overall plan to improve Capital Circle. Utilizing the Blueprint philosophy, safety improvements, extensive landscaping, multi-use trails and improved lighting and stormwater facilities are included in the capacity improvements plans. When completed, this project will widen this segment of Capital Circle allowing for the safe, effective movement of traffic from the Tallahassee Regional Airport to all points north and south, creating an inviting gateway into our community.